As we know synchronization is very essential in digital communication system. This is needed in the receiver to detect the transmitted data from the received corrupt input signal waveform. Three types of synchronization need to be performed in the receiver viz. bit synchronization, frame synchronization and carrier synchronization. Bit synchronization help distinguish bit intervals. Differential encoder is used for this. It removes unintentional inversion of the binary input waveform. Polarity of the differentially encoded signal cab be inverted without having any effect on the decoded signal waveform. Fig.2 Example showing decoding is same even if polarity has been inverted. 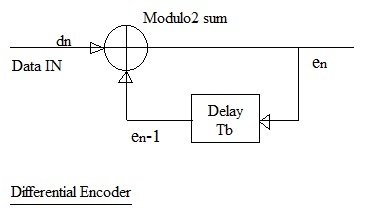 In the differential encoder, input data bits are modulo 2 SUM with the previous output bits. Modulo 2 SUM is same as EX-OR. The differential encoder equation is mentioned below. 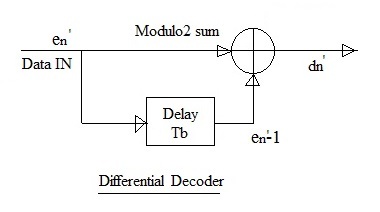 In the differential decoder, current input and delayed version of the same is fed to the module 2 sum. This produces the output bits. 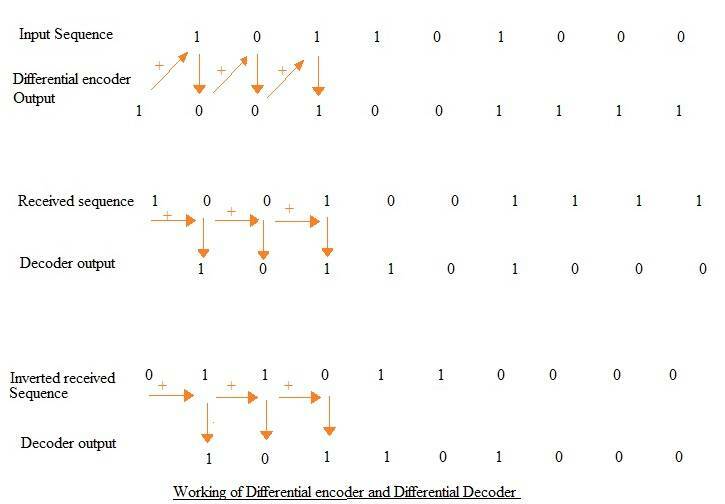 The differential decoder equation is mentioned below. This combination of encoder and decoder help in clock recovery and hence data bit streams can be easily derived even after corruption and phase inversion.